Thereafter, a lot of different functions are available, which allow one to access all mode properties, such as the intensity profiles, propagation constants, etc. The following figures display properties of the calculated fiber modes. In addition, it would be easily possible to use the mode profiles when defining optical channels for power calculations. Note that the mode solver is very efficient. Even when a fiber has several hundreds of modes (i.e., many more than in this example case), the whole set of modes is calculated within roughly a second on an ordinary PC. 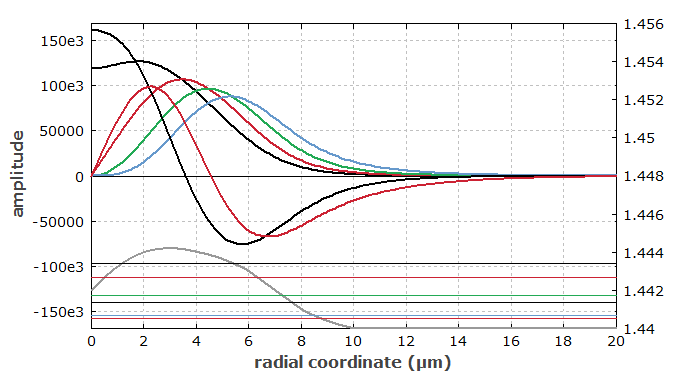 Figure 1 shows all radial functions for the calculated modes. 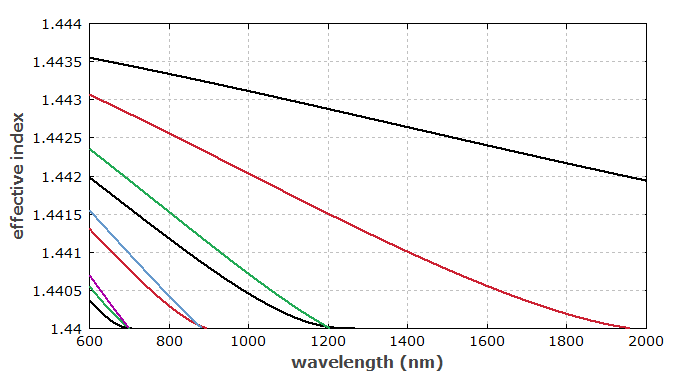 Different colors are used for different l values. The refractive index profile and the effective indices of the modes are also shown. Figure 1: Radial functions of the calculated fiber modes. Figure 2 shows the intensity profiles of all modes with animated graphics. Figure 2: Intensity profiles of the fiber modes. RP Fiber Power itself has been used to create the animated graphics; no separate graphics software is needed. Figure 3 shows the effective refractive indices of all modes (calculated from the propagation constants) as functions of the wavelength. These values approach the cladding index (1.44) at their cut-offs. Figure 3: Effective refractive indices of the fiber modes as functions of the wavelength. Figure 4 shows the fraction of the optical power which is contained in the fiber core, when the wavelength is varied. When approaching the cut-off, this values decreases. Figure 4: Fraction of the power which is contained in the fiber core as a function of the wavelength. 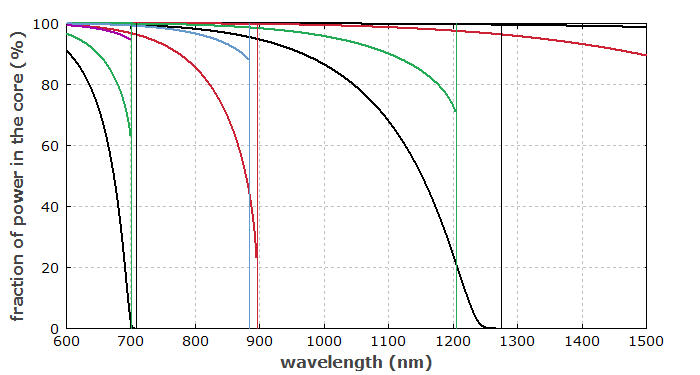 The thin vertical lines indicate the calculated cut-off wavelengths. Finally, Figure 5 shows with animated graphics how more and more modes disappear when the wavelength is reduced. Also note that modes get larger near their cut-off. Figure 5: Amplitude profiles of all guided fiber modes for a variable wavelength.